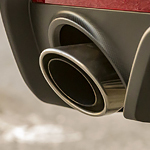 You can also personalize the sound of your exhaust with the Active Valve Performance Exhaust system. There are four settings, including quiet, normal, sport, and track modes. This allows you to set it to quiet mode in the morning to avoid run-ins with light sleeping neighbors, or you can set it to track mode to feel the feel roar of your V8 engine. There are a ton of ways to change up the driving experience with the latest Mustang GT. Want to see for yourself? You can test drive at Sutton Ford Lincoln located in Matteson.